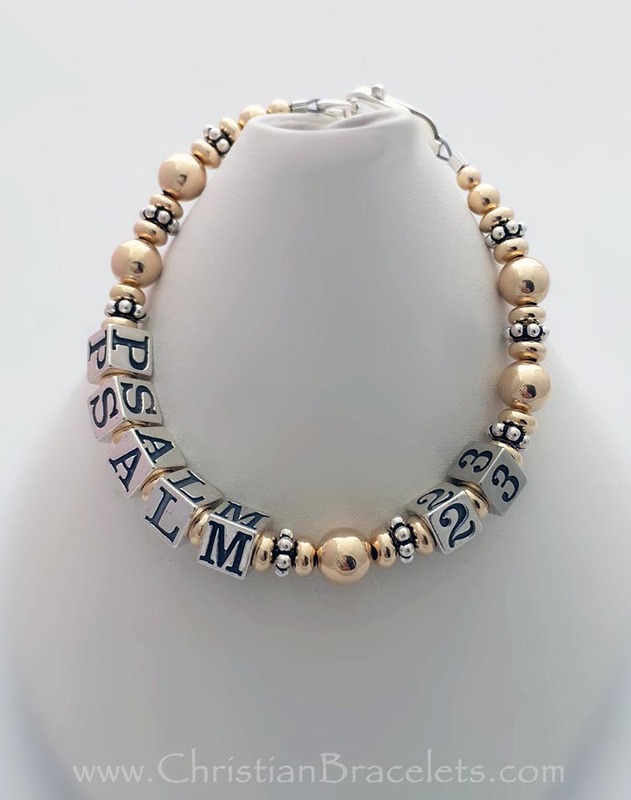 This is a 6 1/4" bracelet - Average is 7 1/2"
Psalm 23 is the 23rd psalm of the Book of Psalms, generally known in English by its first verse, in the King James Version, "The Lord is my Shepherd". The Book of Psalms is a book of the Christian Old Testament and the third section of the Hebrew Bible. In Latin, it is known as "Dominus reget me et nihil mihi deerit". 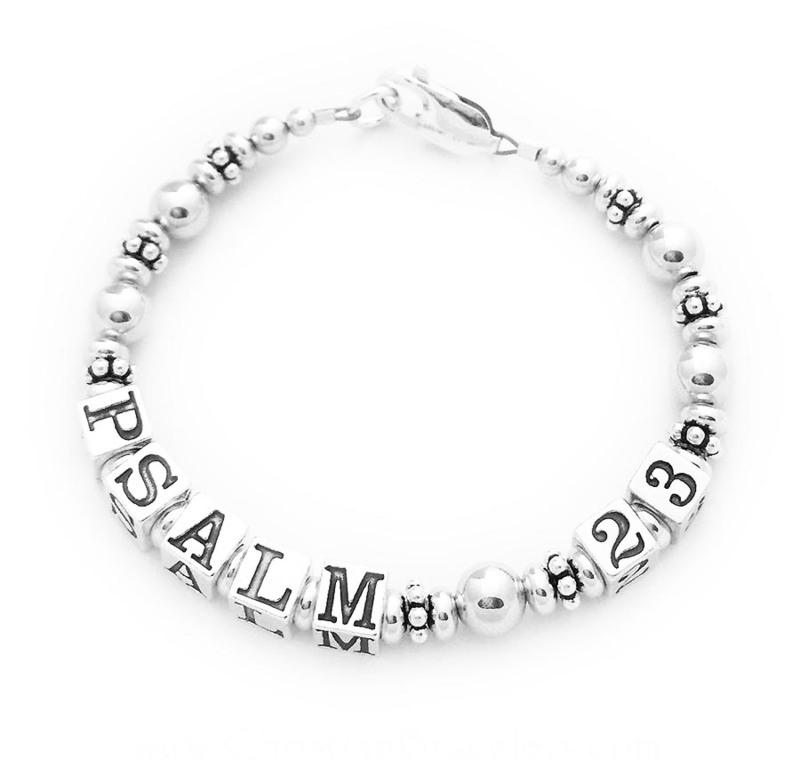 This is a 14k gold-filled and sterling silver Bible Verse Bracelet. It is shown with Psalm 23 but you may choose any verse. If the verse is too long to write on a 1-string you may shorten it or chose the Bible Verse. "The Lord is My Shepherd" was too long to write on a 6 1/4" bracelet. The block letters are 5.5mm with 14k gold-filled saucer beads in between the letters. This bracelet is 6 1/4". 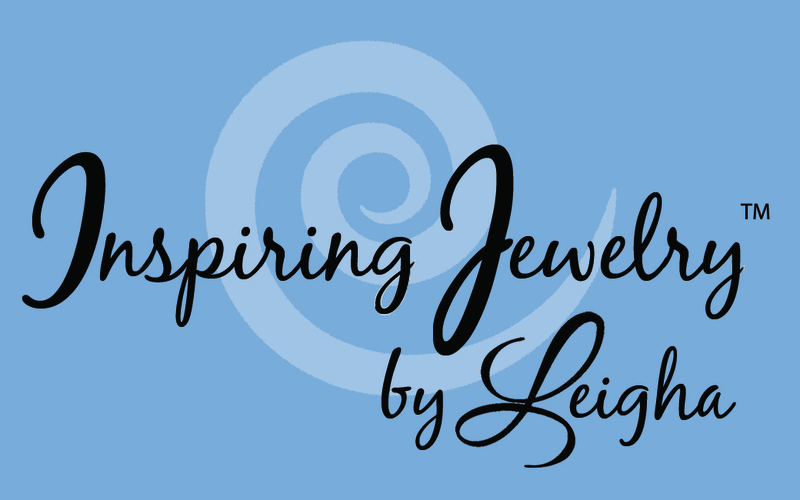 The average bracelet size is 7 1/2". You may have as many letters as will fit on this design. Psalm 23 is the 23rd psalm of the Book of Psalms, generally known in English by its first verse, in the King James Version, "The Lord is my Shepherd". The Book of Psalms is a book of the Christian Old Testament and the third section of the Hebrew Bible. In Latin, it is known as "Dominus reget me et nihil mihi deeri".